Item1: Historical fiction author Debra Swift (@swiftstory) tweeted a Guardian UK blog post by Robert McCrum in which McCrum argues that professional book reviewers are better than amateurs. Item2: Historical fiction survey participants overwhelmingly rank online reviews in blogs and social media sites like Goodreads as their preferred source of book recommendations. Amazon was hardly mentioned as a preferred source. 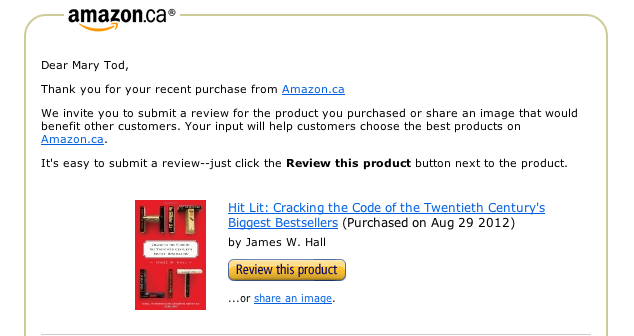 Item3: Amazon sends me a request to review a recently purchased book called Hit Lit by James W. Hall. Is Amazon attempting to counter accusations that reviews on their site are exaggerated or written by friends of wannabe authors or submitted by companies offering reviews for very small sums of money? Will professional book reviewers resurface as the preferred standard of reliable opinion? Why would someone spend time producing a quality review for Amazon without any remuneration? What criteria does Amazon use to send a review request? I think they are just asking for reviews for books they know you have bought. Smashwords does something similar – sends a form email out a few weeks after you purchase a book from them. Interesting thought, Marg. First time I received a request. Within the realm of social media (FB, LinkedIn, Twitter and so on) I see more and more of the media organization sending messages to encourage me to return for more conversations – more eyeballs for them, of course, and the advertisers who pay for our ‘free’ services. Thanks for the post, Mary. What a fascinating survey. The power of ‘word of mouth’ certainly can’t be ignored. I love to read professional reviews but I tend to seek the opinion of my friends as well. The fact this approach has now extrapolated into the blogosphere is no surprise. Indeed, the opinion of an historical fiction buff as to the quality of an historical novel may well be more useful than a professional reviewer who doesn’t like the genre. I am certainly grateful when readers take the time to post reviews on Goodreads or retail sites. And just as the standard of ‘indie’ writing can vary, the skill of some amateur reviewers is very high. Hi Debbie … thanks for your message. Goodreads was the most popular digital site amongst survey participants. Clearly there’s a reason! Did you make your Goodreads friends on Goodreads or did a group of your friends all join up to share book information? I don’t always look at the reviews myself – if the subject matter interests me, I’ll usually read the opening sample pages to see if I like the author’s writing style. If I don’t buy it right away, I’ll add it to my ‘to-reads’ list on Goodreads so I don’t forget about it.